WASHINGTON (REUTERS) - Retired neurosurgeon Ben Carson appeared set to end his bid for the 2016 US Republican presidential nomination on Wednesday after failing to win a single state despite a short-lived surge of support last fall in the early-voting state of Iowa. “I do not see a political path forward in light of last evening’s Super Tuesday primary results,” Carson said in a statement. He said he would also skip the next Republican debate, scheduled for Thursday night in Detroit. Carson signalled his withdrawal after Donald Trump consolidated his lead in the Republican race with a string of victories on Tuesday, but failed to eclipse his rivals or draw reluctant party leaders into his corner. Carson drew the national spotlight to him in October when he pushed past Trump among party voters in some opinion polls in Iowa, which kicked off the state-by-state presidential nominating contests in February. But he saw his support drop after a series of missteps in some of his comments about national security in the aftermath of the attacks in San Bernardino, California and Paris. Carson’s withdrawal would leave four candidates vying to be the Republican nominee in the Nov 8 election to replace Democratic President Barack Obama, winnowing down a field that was once crowded and is now clearly dominated by Trump. The New York real estate tycoon proclaimed himself a “unifier” on Tuesday night after he won seven states from centrist Massachusetts to the conservative Deep South in the contests to pick a party nominee. That fell on deaf ears as his White House rivals were unbowed and the Republican establishment unwilling to accept him as their standard-bearer for November. “If this was anybody else as a front-runner, there’d be people right now saying ‘Let’s all rally around the front-runner,’” said US Senator Marco Rubio of Florida, who won his first state contest, Minnesota, on Tuesday. 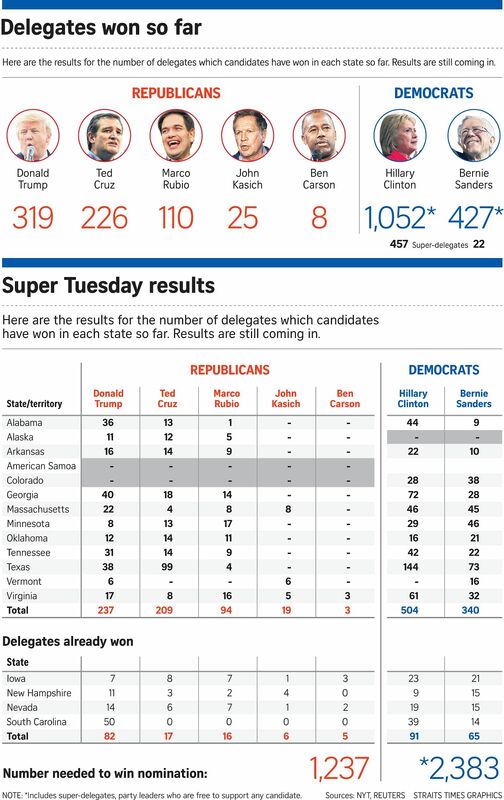 The Super Tuesday wins cemented Trump’s front-runner status. The 69-year-old political newcomer went into the busiest day of the primary season with a hefty lead in national opinion polls and victories in three of the first four Republican contests. His latest wins compounded the problem for a party whose leaders are both critical of many of Trump’s positions and values and sceptical he can defeat the likely Democratic nominee in November, former Secretary of State Hillary Clinton. While they have yet to coalesce around a single strategy, anti-Trump Republicans have begun taking action. Conservative advocacy group Club for Growth claimed credit for slowing Trump in some primary states by running attack ads. Some party donors – including hedge-fund manager Paul Singer and Meg Whitman, the Hewlett-Packard Enterprise chief executive - organised a phone call on Tuesday to get funding for an anti-Trump effort, the New York Times reported. The party’s 2012 nominee, former Massachusetts Governor Mitt Romney, has weighed in against Trump, speculating about a“bombshell” in the billionaire’s tax returns. Romney scheduled a speech for Thursday about the state of the race, media reported. But one of Trump’s former rivals in the 2016 race, Mike Huckabee, admonished Republicans for not respecting the will of the voters. Democrats pounced on the chaos. Senate Minority Leader Harry Reid called Trump a “monster” the Republicans spawned with their years of rancorous opposition to all major Obama administration initiatives. “Republicans created him by spending seven years appealing to some of the darkest forces in America,” Reid said on the Senate floor on Wednesday. On the Democratic side, Clinton, 68, took big steps toward securing her party’s nomination on Tuesday, the 2016 campaign’s biggest day of state-by-state nominating contests. Her victories in seven states were propelled by African-American voters in southern states including Texas, Virginia and Arkansas, home of her husband, former President Bill Clinton. Clinton’s rival, US Senator Bernie Sanders, won his home state of Vermont along with Colorado, Minnesota and Oklahoma, vowed to pursue the battle for the nomination in the 35 states yet to vote. Trump’s main rivals, US Senator Ted Cruz of Texas and Rubio, 44, said they were determined to remain in the race. Cruz, 45, won Texas and Oklahoma, as well as the Alaska caucuses, bolstering the conservative senator’s argument that he has the best chance of stopping Trump. Trump holds a lead in the race to lock down delegates who pick the nominee at the party convetion in July. He has secured 316 delegates, according to a New York Times count, ahead of Cruz’s 226. Carson has won just eight delegates. A nominee needs 1,237 delegates to win and the race could heat up with March 15 contests in Florida and Ohio. There are 99 delegates at stake in Florida and 66 in Ohio, and in both states, the winner takes the whole haul. Facing strong party disapproval over his ideas to build a wall between the United States and Mexico, deport 11 million illegal immigrants and temporarily bar Muslims from entering the country, Trump declared he had expanded the party by drawing in disaffected blue-collar Democrats who like his tough-on-trade rhetoric. The country’s top two elected Republicans, House Speaker Paul Ryan and Senate Majority Leader Mitch McConnell, chastised Trump this week over his delay in disavowing an endorsement by David Duke, a former leader of the white supremacist Ku Klux Klan. Trump insisted he had disavowed Duke and said he did not know Ryan well but was sure they would get along. “And if I don’t, he’s going to have to pay a big price, OK?” the former reality TV star added in remarks that could further inflame party tensions. Ryan’s representatives said they would not comment.